Looks very cool, will try it out soon. Thank you for taking the time to make as well as sharing with us! parse - Will parse all of your gear in your inventories (including MH) to file. Just some constructive feedback. I didn't look at everything, though. It's entirely possible Lua optimizes this under the hood (probably not), but for example, every time you call check_gear_stp(item), you call item:lower() several times, and you're converting the same string to lowercase again and again to match your result. You also do this with dual wield checking. In the same file, there a bunch of really really long else chains that simply assign a value based on a string. This would probably be more efficient as lookup tables for values, which would also make adding and changing values much easier. Overall, the performance hit is probably minor on a single pass, but this kind of thing has the potential to blow up if you're checking a lot of items in a short time. This is one of the reasons i wanted to make the addon public, so that people with good codding practices and knowledge could work on it too, fork the project or just give feedback. I welcome the feedback thankyou. I was trying to type examples but I fatfingered submit. Edit: In general, an if-else chain is going to be faster than a table lookup unless it's incredibly lengthy and the typical case will pass through a considerable amount of predicates (eg, it isn't likely that the condition will be true), but it still comes at the cost of readability and edit-ability, imo. Rrally cool addon. Keeps me out of spreadsheets. Does it do anything for ws set tp return? thanks for the tip. ill look into it. but for now it works really well and i dont have the time at home to rewrite major chunks of code. parenthood is kinda hectic and i only just broke my addiction to this game last year lol. so maybe big revamps will be for future versions or for someone to fork / update it themselves and submit. but i do appreciate the time you took to explain the concept, thanks. I took your tips and used them, I'm currently working on optimising the way GearInfo parses the "description" of items from the resources. So i created a stand alone version of it called Exporter on my GitHub. Its way more powerful then the one in GearInfo and i think the code is also a lot tidier thanks to your tips. 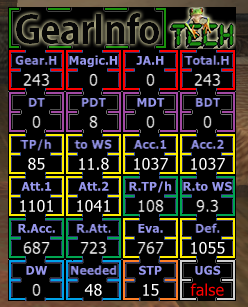 Will incorporate the code to GearInfo soon once I've finished it and I'm satisfied with it. The addon does need some polish, especially like you said with the string:lower() repetition. So ill work on optimising that when I have time. Kids are off school at the moment so time is none existent lol but i will get round to it. I'm hopping some of my friends that have been using it since day one will come post and leave some of their personal thoughts on the addon. Their testing has been invaluable to find bugs, especially with the buff parsing in places like salvage and Omen that used to cause crazy errors. Anyway any more feedback from anyone would be super appreciated. i will also be adding more to the Gearswap section of the GearInfo wiki soon. Cor rolls is going to be a *** for tracking, but i will be giving it it a whirl eventually, i just need time. indeed right now it only tracks pretty much all sources of haste (except food if there are any) and once i revamp some more of the core code a lot more buffs and specific stats like attack etc will be tracked. Right now the Accuracy calculator is buggy and causes a massive hit to the game system and causes lag, but i haven't figured out why. I recommend just ignoring that one for now. just a note on the buff tracker for the haste values. it does make some assumptions if the buffs potency is affected by the casters skill. like the potency of haste bubble from geo is assumed. while bard buffs are calculated by the bonus you tell the addon the bard has, it still assumes the bard has capped skill (it is 2018 after all, if your not capped then "git gud" i guess lol). it also tracks "the buff" slow, i specify say buff due to the fact i havnt coded a way to track monsters using abilities / spells that might include slow or slow II. a lot of the reasons above is why i added a manual way for you to add some of these values, like more Store TP you know you are getting from buffs or food etc. You can use the command //gi stp +##. also thank you very much for the kind words, im glad your enjoying it and getting use out of it. You should defo try it with a gearswap lua. look at the wiki for a basic explanation of how to set it up (it will be more in depth eventually) i do have several already written luas that are good to go and work with Gi. pushed version '1.6.3.0' to merge string parsing code from Exporter and disabled Accuracy parsing due to code change and the fact it was inaccurate and caused stability issues. once loaded use command //gi parse to refresh your file. Its seen to try to calculated DW when I don't have any, current job is War/Sam. to clarify, in the resources straps are classed as weapons but do not have a base damage value. due to the new way i parsed the strings etc, i no longer add a value of 0 to items that have no damage, and so the code failed the check. Fixed gona push new update with the other stuff ive been working on today. Really sorry for the bug. thanks for posting it. Do I really want to spend a month redoing my lua's is it worth it people who have tested and used this? This shouldn't result in you redoing your luas, it is information that is widely available and easily calculated. The job guides already factor this sort of information, it's not changing perception of what sets are best or anything. It's just a neat tool for people who like to visualize things, not really useful for anyone who knows what they're doing. Don't use GS, but if for nothing else but the on-screen "DW needed: values as Ninja, it's super useful. Shows your /checkparam and tp/hit as well, which is quite helpful. Much thanks. Is there a possibility to display DT/PDT/MDT values? This would be cool as well. I concur. not to claim your wrong but this addon will help you automaticly change sets sets bassed on buffs you currently have. The luas i created have excessive sets based on things like how much DW u need for max attack speed. you can also use it on any other job that doesnt DW to help you generate sets bassed on how much haste you have. by this i mean in situations where all sources of haste are capped, i.e. your ja haste and magic haste, u can actually drop haste from gear because of the overall cap. I've yet to see any freely available GS luas on any forum track buffs automatically as efficiently as GearInfo does. and to take this further most GS files require you to use toggles to switch your sets for the "correct situation". i created GI to say F*** that to extra toggles. this is from a dnc lua. Notice there are sets define for if u change from DW to single etc. and this is auto updated by GI too. GI will also auto detect if your moving and tell gearswap to equip move speed gear (usefull if u dont speed hack) and u can auto equip based on situations like when not engaged. I mean maybe someone has written a lua that can do all these things, but ive yet to find it. Dont get me wrong im not trying to force anyone to try it with my GS luas but im extremely certain anyone who does is gona go "holy ***-a-moly". -- SD = "Saber Dance"
i can very easily add this as the string parsing updates i added just today will allows me to just plug a stat in and it will pull the numbers from the gear. ill look at adding it for you guys with the option to display or not. Don't know how to, so just stuck with gear sets. I've been reading through this off and on all day and I'm just curious on your last post about GI feeding into to Gearswap. I too use Kinematics and actually have modified it quite extensively to do things such as check if I'm asleep or not, check my hp/mp, etc., etc. So really your stuff isn't that complicated when you break it down. It's just a ton of repetition of sets. Which is amazing, don't let me minimize that, but nothing hard. What I'm curious is to get GI to talk with Kinematics, all I should have is the "function gearinfo(cmdParams, eventArgs)" correct? With this in, I can then do things like "sets.engaged.DW['Ilvl~124+']['DW: 28-30']['SD']['AM3']" and Kinematics gearswap will equip the correct set based upon GI info? Does GI really read the level of the target? Should look into ashita, i found xml's to be much cleaner and easier to work with than using luas for gearswap and what not. it doesnt read ilvl of the mobs no, the ilvl thing is just the naming convention i use for accuracy tears. people might use low medium high instead. i just prefered doin it by ilvl content. which most my friends who use it say it makes more sence to them so i stuck with it. Also in terms of making GS respond to the values from GI, ud need a bit more code then what u suggest. but in principle yes. GearInfo: Lua runtime error: gearinfo/Statics.lua:4: attempt to index global 'player' (a nil value). I don't know the fix, but just thought you should know incase this goes to global windower.